By automating user creation and rights the Q Ware LDAP sync is going to save our IT Department a significant amount of time. We no longer have to duplicate our efforts between Active Directory and Q Ware. Having one less password to remember is great for our users frustration levels as well as a time saver for the IT Department. Q Ware can connect with user management systems, like Windows's Active Directory, via Lightweight Directory Access Protocol (LDAP). This connection allows administrators to add/remove users to and from Q Ware and synchronize usernames, passwords, and contact information using automated processes. This saves valuable time for both I.T. departments and administrators of Q Ware. how can ldap help your organization? Some organizations require hundreds of work order requester (user) logins. 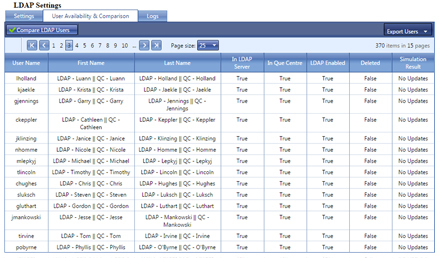 Without LDAP, users need to be manually managed in Q Ware when employees join or leave the organization. The Q Ware LDAP Add On can sync with larger user management systems, like Active Directory, to automate the management of user credentials and contact information. The add on is built within the Q Ware platform, as opposed to integrating a third party plug-in. This means the software can adapt to your organization’s requirements. Q Ware can conformed to work the way you do, as opposed to your organization making changes to work with a plug-in. It’s secure. The add on works within your organization’s security protocols, as opposed to single sign in services that rely on cookies and other less secure methods of authentication. Q Ware users are added/removed dynamically. A user's login credentials will be the same as their network profile. Default service area and user groups can be set for new users. Automatic data synchronization happens during a regular nightly process. Data synchronization occurs when users log in to Q Ware. Admin. can review sync updates before synchronization occurs. Admin receive a sync change summary email when synchronization completes.